View More In SD & SDHC Cards - Page 2. Better Performance, Higher Productivity The Superior Pro series delivers blazing-fast read/write speed up to 90/80 MB/sec. Designed for the latest DSLRs and camcorders, this card delivers uncompromising performance to enhance workflow for professionals require. To reach the maximum read/write speed, a UHS-I enabled and USB 3.0 reader or host device would be recommended. Idea for 4K High Resolution Recording With a large capacity up to 128GB and great transfer speeds, the Superior Pro series is the ideal choice for rapid consecutive picture taking, 4K, 3D and full HD video recording without interruption or delay. Designed to Survive in Harsh Environments The Superior Pro series is built to withstand difficult conditions with waterproof, shockproof, X-ray proof and temperature-proof protections. You can enjoy outdoor activities and travelling overseas without worrying about data loss or damage. 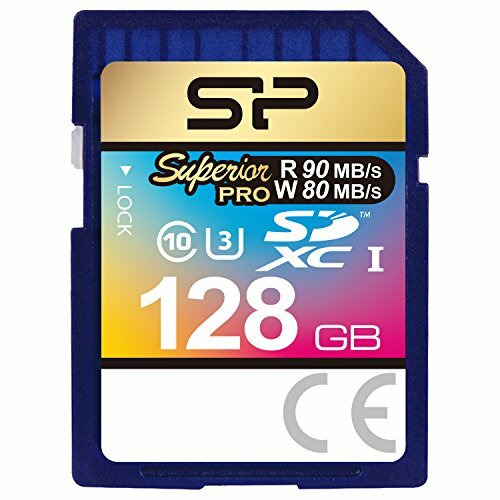 Meet Your Storage Capacity Needs The Superior Pro series is available from 32GB to 128GB to meet your storage needs of big capacity. Take 128GB as an example, it allows you to keep up to 28.3 hours of videos and 48,000 photos. Lifetime Warranty The Superior Pro series is backed by lifetime warranty. Please register your product via SP official website to get complete manufacturer warranty services, product support and more. Box Contains1 x Silicon Power Superior Pro Memory Card. Manufacturer: SILICON POWER COMPUTER AND COMMUNICATIONS USA INC. Publisher: SILICON POWER COMPUTER AND COMMUNICATIONS USA INC. Studio: SILICON POWER COMPUTER AND COMMUNICATIONS USA INC. If you have any questions about this product by Silicon Power, contact us by completing and submitting the form below. If you are looking for a specif part number, please include it with your message.